Expatriation Preparation: Swimsuit Season??!! Fuel Cycle Menu coming up! Swimsuit Season??!! Fuel Cycle Menu coming up! Eek! Summer's here, and this Mama is very NOT ready for swimsuit season! To help get a little more prepared, I'm planning to do my third Trim Healthy Mama Fuel Cycle this week. The first time I tried one, I lost about 5 pounds. The second one, I only lost one pound during the Fuel Cycle week, but then I lost another 3 the following week. Since I generally only lose about .2 pounds a week (if that much), these were FANTASTIC losses for me! You'd think, with losses like those, that I might do the Fuel Cycle more often, but for me, that's not a wise choice. It's a pretty restricted week, and it takes lots of planning and prep work to make it successful. And I am looking for a sustainable plan, not a get-trim-quick plan. So I only do a Fuel Cycle week every few months. And if you are new to Trim Healthy Mama, the Fuel Cycle is NOT recommended for beginners - it will give you a false impression that THM is restrictive, when, in reality, it's one of the least restrictive plans out there. Plus, so many people have luck just freestyling the plan that it may not even be necessary! I'll also note that many of the recipes in my menu plan can be found in the Trim Healthy Mama book available as a huge printed tome on Amazon or in print and ebook formats through trimhealthymama.com. 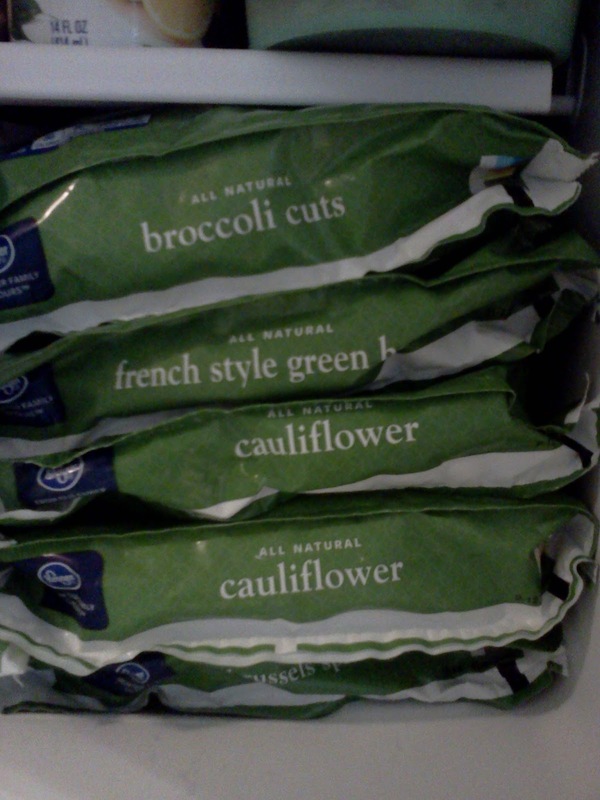 Wanting to make room for Fuel Cycle friendly meals, I cleaned out my freezer. But I found so many things I could use to make this week successful that not only will I be helping my weight-loss along, I'll also be using up a lot of my freezer stock while I'm at it! Kai si ming, salmon fillets, chana dahl, brown rice, spicy lentils, enchilada soup, lots of berries, and an endless supply of frozen veggies - here's just a sampling that were buried so deep I didn't realize I had them! I'm linking up to Trim Healthy Tuesdays over at Gwen's Nest and Stacy makes Cents - make sure to check out all the trim healthy treats to be had! 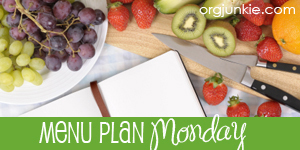 I'm also linking up to Menu Plan Monday over at Organizing Junkie. Head on over and see all the great menu plans to inspire you! fotato soup is in the book, but I think it's actually called "Loaded Fotato Soup"
Aldi is a grocery store, and their store brand line has a flatbread that is FP if you just eat 1/2 (which is plenty big for a wrap). You could sub any FP wrap or low-carb tortilla for that (I haven't been able to find Joseph's products). Savory tomato schmear is, basically, yogurt cheese (strain greek yogurt overnight), with tomatoes and chilis added. you could easily sub laughing cow cheese for that. I wish we had an Aldi. :-( Sad. Thanks for sharing at Trim Healthy Tuesday! It's funny how weight loss kicks in *after* sometimes - that happened for me last time too. Very well done! :) Like this a lot! I also really like your pre-menu explanation... very sound THM doctrine! lol :) Sharing this one with friends. Thanks! I'm having fun with this menu and not feeling at all deprived! Now that it's past.. how many lbs did you lose on this cycle?